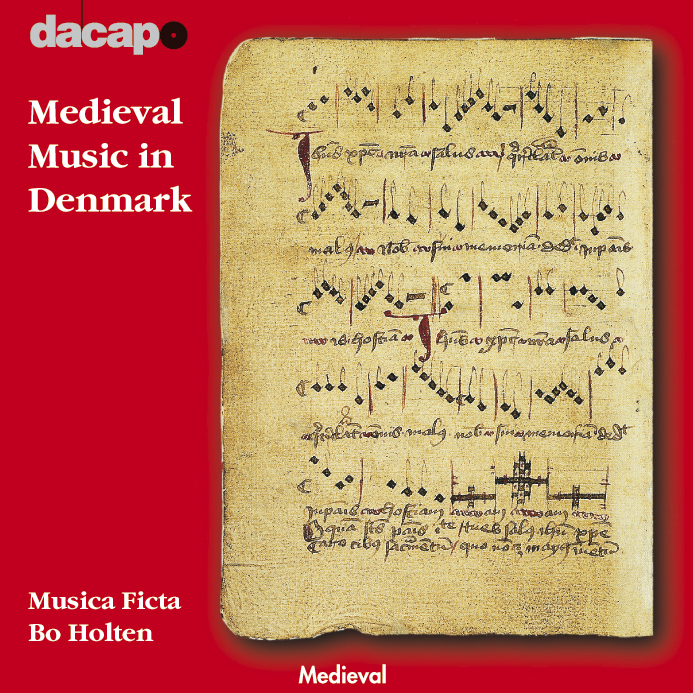 The music contained on this recording ranges from the earliest known - regrettably unflattering - mention of Danes in music in the 9th century to Danish songs from the 15th century. It includes 13th century Parisian polyphony found in a remarkable Danish source and Danish versions of songs from the international repertory and thus illustrates both a Danish contribution to European music and the musical contacts that Denmark enjoyed with the rest of Europe in the Middle Ages. Gaude Mater 1:50 8,00 kr. Summa pia gratia 1:54 8,00 kr. Regalis ostro sanguinis 2:06 8,00 kr. Ecclesie prosapies 2:01 8,00 kr. Decus regni 4:47 8,00 kr. Jhesus Christus nostra salus 1:31 8,00 kr. Maria candens lilium 2:28 8,00 kr. Beatus vir 7:12 12,00 kr. Alleluya V . Pascha nostrum 7:48 12,00 kr. Gaudeat devotio fidelium 1:32 8,00 kr. Ave martyr dux Danorum 1:44 8,00 kr. Drømdæ mik æn drøm 1:21 8,00 kr. Christ undhæ megh 2:44 8,00 kr. Mith hierthæ brendher 2:09 8,00 kr. Gaude Maria V . Gabrielem Archangelum 8:05 12,00 kr. Nicolai solempnia 1:23 8,00 kr. Caterva nostro laudibus 1:38 8,00 kr. O rosa in Iherico 1:12 8,00 kr. Letificat laudacio 1:36 8,00 kr. Christus resurgens V . Dicant nunc Judei 6:29 12,00 kr. Gaudet Mater Ecclesia 3:27 8,00 kr. Cover picture: A Danish manuscript of Jhesus Christus nostra saluswritten c.1450.